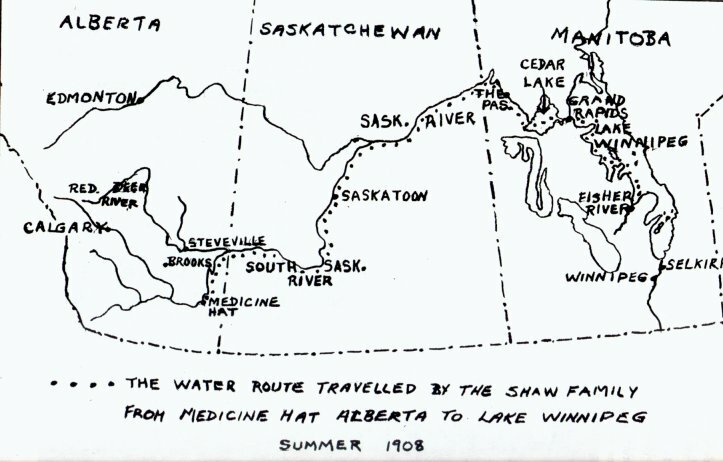 The sketch map below details the route of the 1908 river trip taken by Ambrose and Jane Shaw, floating their family and all their possessions from a failed homestead attempt in Medicine Hat, Alberta, back to Snake Island in Lake Winnipeg, Manitoba. Ida Shaw was 12 years old at the time of the adventure, and the map (click to enlarge a bit) was hand-drawn by her son, based on her recollections. It is shown in the family history book The Coultis Connection, published in 1986 by the Coultis sisters, descendants of the Shaws. Ida passed away in 1976, aged 79. Sylvia Harron had long held the dream of retracing her ancestors’ migration. In 2000, with then partner greg blanchette, she built a 5-metre (16-foot) plywood, flat-bottomed, oar-powered punt, christened the Ambrose Jane, and the pair spent the summer on the river. This is the journal of that trip.